The Danish seaside town of Skagen is an artists’ paradise in summer, but only the locals live there in winter. 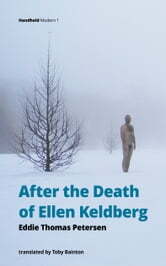 The elderly artist Ellen Keldberg was found frozen on a street bench, and now lies laid out on her bed, waiting for a post-mortem. Two visitors come from Copenhagen on a snowy night after her death. Her student nephew Mikkel is there to organise her funeral, yet he can barely remember Aunt Ellen and knows nothing about her life. Anne Sofie comes to pursue her ruthless quest single-mindedly. She will allow no-one to hide, or obscure the truth about Ellen, and leads Mikkel into a hopeless chase. Before Anne Sofie has finished, there will be blood in the snow, and she will have photographed death. This subtle novel by the Danish writer Eddie Thomas Petersen is a family saga, and a portrait of Skagen in the dark and in the snow, full of art, alliances and old secrets. Toby Bainton’s translation does full justice to the gripping narration.